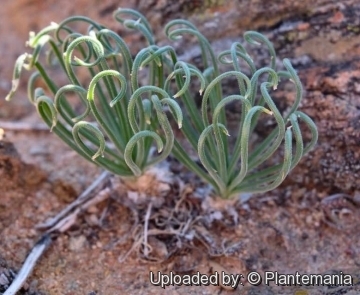 Origin and Habitat: Albuca spiralis is distributed over a wide area of the Cape from the Peninsula and Worcester throughout the Roggeveld to Namaqualand, South Africa. Altitude range: 60 - 2255 metres above sea level. 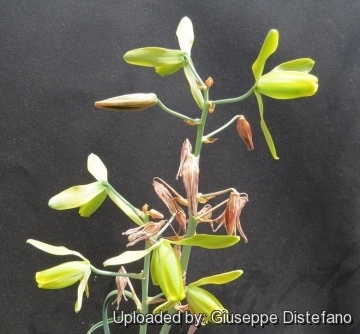 Habitat and ecology: Albuca spiralis is a fairly common winter-growing geophyte found in seasonally dry grasslands, open woodlands and Scrublands. 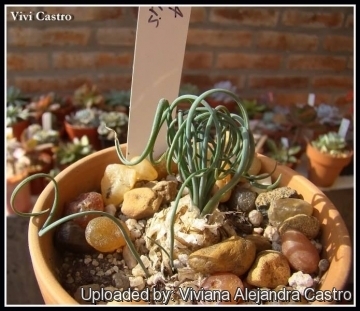 Description: Corkscrew Albuca (Albuca spiralis) is a small geophyte growing singly or forming small groups by division. 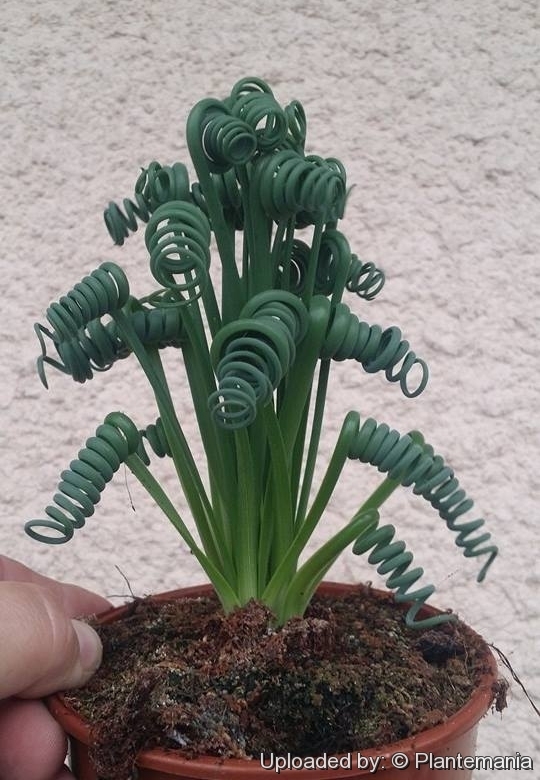 This Albuca gives an interesting show even when it is not in flower. During the winter months when it is actively growing its wiry foliage corkscrews and twists in a most fascinating manner. The degree of spiral depends on the clone and the amount of sunlight the plant receives when the leaves started growing. The flowers are green with pale yellow margins, nodding, sweetly scented, reportedly of butter and vanilla, and look like helicopters. The smell can be quite strong on a warm sunny day. After flowering and seed production is complete the bulb goes to sleep for the summer but reliably returns in the autumn to invigorate the winter landscape. Bulbs: Small, ovoid. In habitat, the bulb grows to a maximum of about 8 to 25 mm long, and 5 to 25 mm wide, but can be twice that size in cultivation. Bulb scales green, fleshy, withering gray and membranous. Tunics not splitting into fibres at the top. The bulb tips are exposed. Leaves: 10–12(-20), form a basal rosette, linear filiform, subterete, 2-15(-22) cm long, 1 mm wide, channelled down the face, upright at bottom then convolute and spirally twisted at end, densely glandular-pubescent, flexuose villose scabrous than the scape. 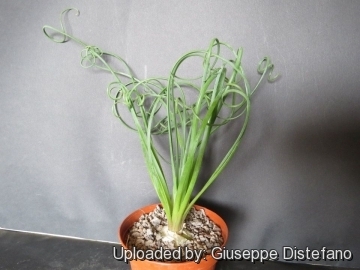 The tightly coiled leaves of Albuca spiralis ensure maximum exposure to weak winter radiation, and reduce the risk of wind damage to valuable photosynthetic tissue. The leaves dry up in summer. Inflorescence: Peduncle slender, 15-20 cm long with glandular hairs at the base. Raceme laxly (1-)4-5(–6)-flowered; pedicels nodding at the apex, lower 2-2.5 cm long. Bracts lanceolate, 12-18 mm long and 4 mm wide. Blooming season: The flowering period is late winter to mid-spring. 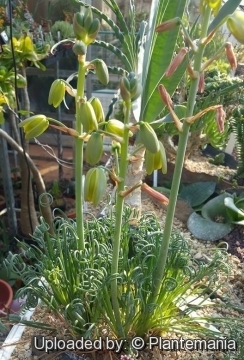 8) Pacific Bulb Society contributors "Albuca spiralis" Pacific Bulb Society Wiki <http://www.pacificbulbsociety.org> version December 28, 2013, at 09:39 Web. 23 Oct. 2014. 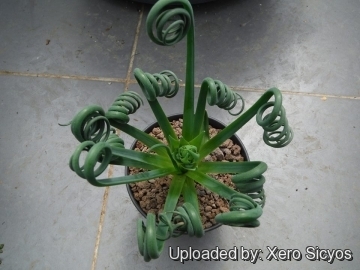 9) Yucca Do Nursery, Inc. “Albuca spiralis” <http://www.yuccado.com/albuca-spiralis.html> Web. 23 Oct. 2014. 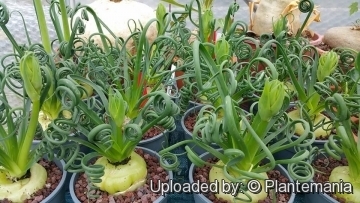 Cultivation and Propagation: Albuca spiralis is one of the most difficult members to cultivate successfully over an extended period. It is a winter-growing and summer-dormant species that needs to be kept almost dry during its dormancy as the bulbs is disposed to dwindle and rot. Its summer rest must be absolute and does not initiate new foliage until the cooling effects of autumn. This plant may or may not have foliage in the heat of the summer. If it does have foliage, during the hottest part of summer, the foliage and plant may look ratty but as long as the bulb is firm the plant is in good health and it will improve in appearance once new foliage initiates in the autumn. A great plant for the southern rock garden as well. Waterings: Water sparingly when growing and a little care, it is a definite water-wise species. The curling of the leaf tips is largely dependent on weather conditions. Cool dry conditions encourage the leaf tips to curl, while warm most conditions tends to encourage erect, straight, uncurled leaf tips. If the plants are allowed to dry too much, they will go dormant.